The world has seen many top distance runners breaking the Marathon World Record time and again, ever since the Marathon was introduced in 1896 in the Modern Olympics. As many as 800 marathons are held all over the world each year. Millions of athletes, all across the globe, compete to win the coveted title for its sheer magnitude and pinnacle of success in the world of athletics. The 2018 Berlin Marathon edition saw the Marathon World Record shattered by an amazing 78 seconds by one of the greatest distance runner from Kenya – Eliud Kipchoge. The 42 km distance was covered by Kipchoge at a blistering pace, full of confidence and determination clocking 2:01:39. 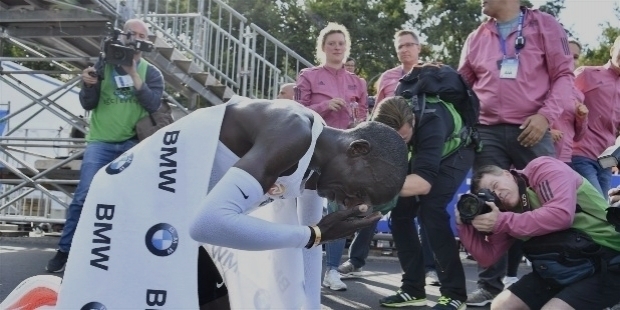 Eliud Kipchoge bettered compatriot Dennis Kimetto’s World Record of 2:02:57, set in 2014 Berlin Marathon edition. Kimetto is the first distance runner in the world to run a marathon under 2:03. As soon as Kipchoge crossed the finish line, elated to the hilt, he ran straight into Coach Patrick Sang’s open arms. The two celebrate the unbelievable run ecstatic among thunderous applause from the spectators. “I lack words to describe this day. I am really grateful, happy to smash the world record. They say you can miss it twice, but not third time. So I want to thank everyone, who has helped me. 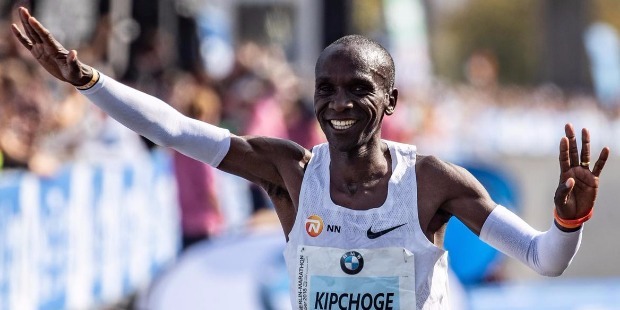 I am just so incredibly happy to have finally run the world record, as I never stopped having belief in myself,” stated an elated Kipchoge to complete hattrick in Berlin. He has won the 2016 and 2017 editions of Berlin Marathon. Eliud Kipchoge and his Coach Patrick Sang had really worked hard to prepare for the world record run. 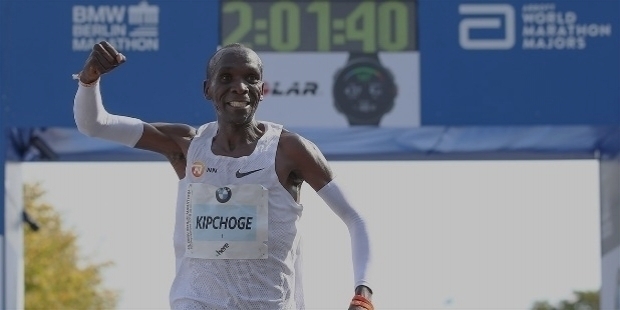 Kipchoge did not disappoint his Coach to achieve the expected result with his sheer determination and strong belief. His pacemakers did a wonderful job to lead Kipchoge through 25 km. Kipchoge was in superb form and did not show any sign of slowing down his pace. Kipchoge shook off Wilson Kipsang, his biggest opponent. The weather conditions were perfect, with virtually no wind. It was a one-man show against the clock. Kenyans Amos Kipruto and Wilson Kipsang finished second and third respectively. The Kenyans completed a clean sweep winning the top three spots. The legendary Kenyan distance runner sprinted in delightful emotions towards the finishing line. He waved towards the crowd as he crossed and celebrated an alone moment in sheer disbelief shaking his head in joy and happiness. Kipchoge then ran towards Coach Patrick Sang’s open arms. It was a wonderful sight to see the Coach and his favorite pupil to achieve the great feat. By shattering the Marathon World Record, the Kenyan star’s is eyeing towards the next out-of-this-world record to run a ‘Below 2 hours’ marathon. Kipchoge’s greatness in marathon running is simply amazing. Having entered the world of marathons in 2013 in Hamburg, Kipchoge has won ‘World Marathon Majors Series’ runs in 2014 Chicago, 2015 and 2017 Berlin and 2015, 2016 and 2018 London. Eliud Kipchoge has won 11 out of the 12 marathons, he has competed. This also includes the Olympics. Eliud Kipchoge’s success in the world stage became conspicuous when he won the ‘Junior Race’ at the IAAF World Cross Country Championships in 2003. He set the World Junior Record in 5000m on the track and became the World Champion at the 2003 World Championships in Athletics. A truly dedicated athlete, he eats and breathes running with an undying passion. At the 2004 Athens Olympics, Kipchoge won the 5000m Bronze for Kenya. At the 2006 IAAF World Indoor Championships, Kipchoge won another Bronze medal for Kenya. He bettered his podium finish at the 2007 World Championships in Athletics to win Silver medals. At the 2008 Summer Olympics, he won another Silver medal. However, the year 2009 was a learning curve for Kipchoge as he finished 5th at the 2009 World Championships. He trained harder and at the 2010 Commonwealth Games, Kipchoge finished second behind Moses Kipsiro in 5000m. Every successful journey does experience failure to strengthen an individual. Kipchoge also faced failure, when he failed to make it for the Olympic Team at the Prefontaine Classic. He finished 7th in 10,000m race to fail in making a third consecutive Olympic Team. Kipchoge changed his focus towards half marathon and made his debut at the Lille Half-Marathon. He clocked 59:25 minutes for the third spot. It is the ‘third-fastest debut half-marathon’ in history. He stood 6th at the 2012 IAAF World Half Marathon Championships. 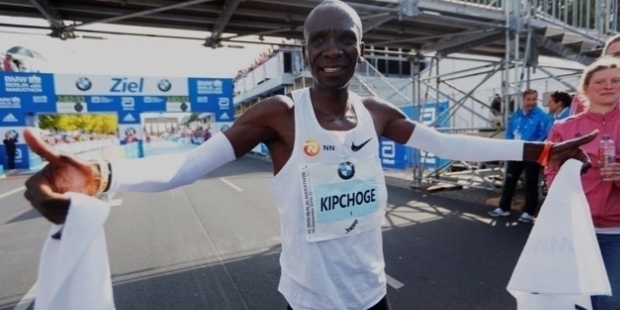 By 2012, Kipchoge began concentrating towards road running. At the 2013 Hamburg Marathon, Kipchoge set a new course record of 2:05:30 in his marathon debut. In 2014, he bettered the record by running the distance clocking 2:04:05. It was the fifth-fastest marathon recorded in history then. Kipchoge has earned high respect from fellow runners for his amazing track record. In 2018, he completed his hattrick at the London Marathon, having won the title previously in 2015 and 2016 editions. By winning the 2018 Berlin Marathon in a new world record, Kipchoge completed his hattrick. 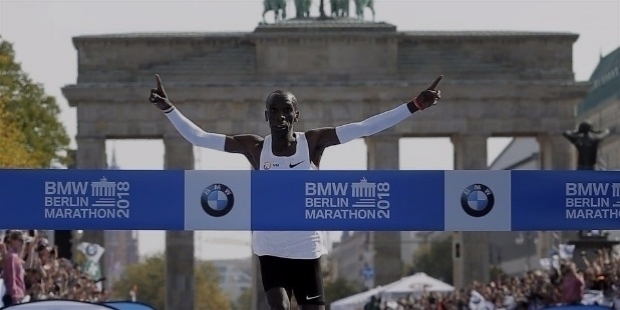 Previously, he had won the 2015 Berlin Marathon edition clocking 2:04:00. He bettered his own time in the 2017 Berlin Marathon edition by clocking 2:03:32. At the 2016 Summer Olympics Marathon, Kipchoge won the Gold medal in marathon clocking 2:08:44. At the 1908 London Olympics, when the marathon was run over its current distance of 26.2 miles for the first time, American Johnny Hayes surprised the world to clock 2:55:18 to win the Gold medal. In exactly 110 years, distance runners have bettered the marathon world record by an amazing 54 minutes. Scientific evolution and technological revolution have seen athletes breaking new frontiers to keep lowering the world record. The “Breaking2” experiment by Nike failed to achieve the desired result on the 6th of May 2017 at Formula One Autodromo Nazionale Monza race track in Italy. The “Breaking2” project by Nike was to break the two-hour barrier for the marathon. The project was announced in December 2016 by Nike. An organized team of three elite runners would train for a private race. Eliud Kipchoge missed the goal by just winning the race clocking 2:00:25. 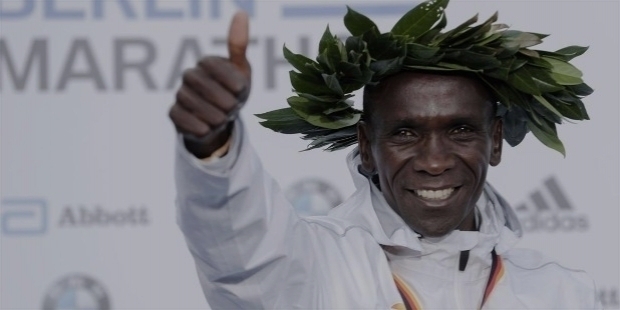 The defending Olympic Champion Eliud Kipchoge, Zersenay Tadese – the half-marathon World Record holder, set in 2010 with a time of 58:23 and Lelisa Desisa were chosen to compete over the distance. Nike brought in 30 of the world's best runners to serve as spacers for the race. Andrew Bumbalough, Sam Chelanga, Chris Derrick, Bernard Lagat, and Lopez Lomong were roped in as pacers for the trio. A special new running shoe was developed by Nike for the never-tried-attempt to break new frontiers in marathon running. Monza automobile racetrack was chosen for its low altitude, calm weather conditions, and short lap length. A group of pacemakers was positioned to shield the key athletes to reduce wind resistance, along with a pacemaker vehicle. Everything was thought upon to break the 2:00:00 barrier. A pace of 4:34.5 per mile (2:50 min/km) was required to break the two-hour barrier. The runners started off at the stipulated pace. First, Desisa fell off the pace about 16km in. Tadese followed around 20km. Kipchoge maintained the pace through 25km at 1:11:03. At 30km, he was only one second off the pace. Ultimately, Kipchoge finished the race in 2:00:25. It was a race of a lifetime. Indeed, a lot has changed in training and technology since then. 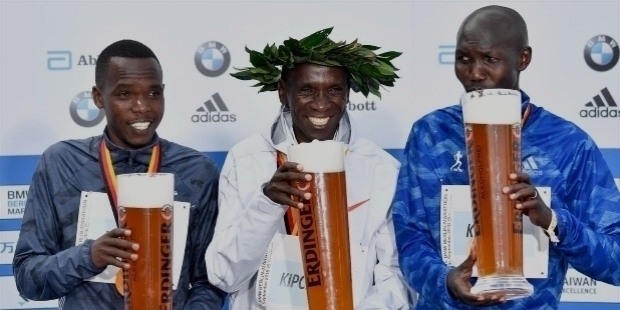 In 2014, Kenya's Dennis Kimetto became the first man to go under 2:03, clocking 2:02:57 in Berlin. He later clipped another 26 seconds breaking his own Marathon World Record. Breaking the 2-hour barrier still seems to be beyond outstanding athletes of the world. The quest is on. Eliud Kipchoge has tried his level best on the 16th of September 2018 to clip an amazing 78 seconds to create a new Marathon World Record. This is by far the largest single improvement on the world record in more than 50 years, after Australian Derek Clayton, who knocked it down it by 2mins 37secs way back in 1967. 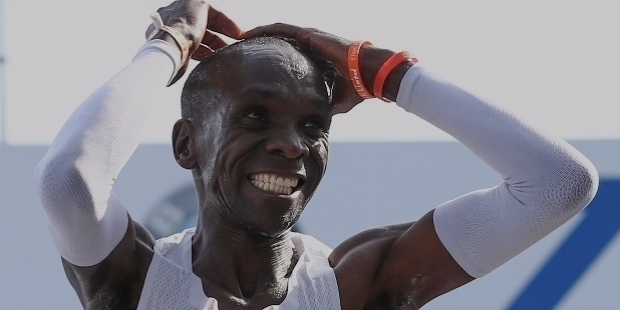 Kipchoge's World Record of 2:01:39 may stand for a long long time to be broken. 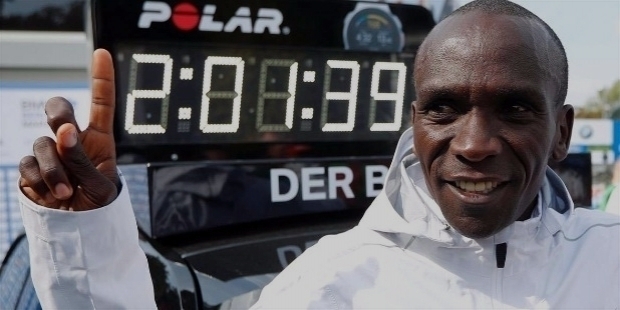 However, many believe the 33-year-old Kenya’s legendary marathoner might break to better his own World Record.